I recently purchased tickets for an international trip from France to the Netherlands. The itinerary​ included an international ticket to Rotterdam, and a local ticket to my final destination. I accessed the ticked via the NS International app on my phone. Everything went fine until I arrived at my destination, Voorschoten station. This was not a large station, and I found a line of people scanning their OV Chipkaart to open a gate and exit. There didn't appear to be any way out without a card. I didn't have one, so I made a dash behind someone else when the next train arrived. Now I need to make my return trip from the same station. Is there a legal, standard way to use my electronic ticket to open the OV card gate? In principle, every entrance or exit should have at least one gate able to scan paper tickets. They look pretty much the same, save for the fact that instead of the opaque card reader, you will see a little window with a scanner inside. 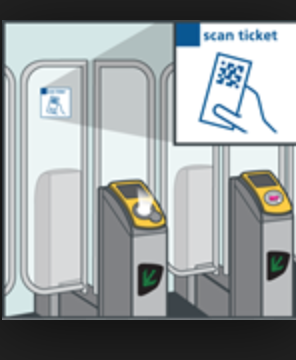 On a typical station, you will have a row of gates with only a card reader and only a single gate (typically also one of the larger ones designed for wheelchairs and people with luggage) able to read both cards and barcode. Not the answer you're looking for? Browse other questions tagged netherlands train-stations or ask your own question. Can I use the OV-chipkaart to get from Schiphol to the center by train? How do you operate an OV-Chipkaart Automaat?